What a gorgeous ring! 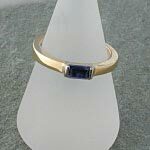 The white gold joins seemlessly with the yellow gold, and teh sapphire is massive. My only concern is that as I am not used to having a ring that sticks out, I might loose the sapphire. Probably a silly concern! I love it!